Everyone is under the assumption that Saskatchewan is all flat prairie with a lot of grain elevators and ghost towns. Well if you have not all ready heard there are lots of hills around this province that hide some spectacular sites. Some of these sites include the Crooked Trees. A group of Aspen Trees growing crooked and twisted at the edge of a field. Shrouded in mystery these trees are an attraction for all to see. The origins of the trees are unknown. Even more interesting is that the grove of aspen beside them are growing perfectly normal. Some say the trees became this way because of a flying saucer, alien urine, lightening strike, radiation in the soil, etc. There is no real answer to how the trees became this way. 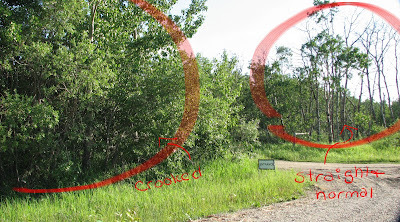 A group called the friends of the crooked bush have posted a sign on the spot about them, as well there is a boardwalk through them and a small picnic area. If you get a chance you should head to the Thickwood Hills to check them out. The Crooked Trees of Alticane are one of the most amazing wonders of Saskatchewan. To call these trembling aspen crooked is an understatement. The branches twist and contort at incredible angles. The cause is from a genetic mutation. However more colourful is the local folklore which states that aliens urinated on the trees. These trees are truly amazing. It is so nice to have something like this in our province. I checked out your website - beautiful artwork you have. The bright vibrant colors & creative way of portraying the trees is a delight to see.